Cropping intensification in rainfed rice-based farming systems through multiple cropping after the rice harvest by using residual soil moisture and supplemental irrigation offers a way to increase agricultural productivity and boost rural incomes in Northeast Thailand. This study identifies localities, planted areas, types of crops, and number of households growing crops after rainfed rice in Khon Kaen Province; it also analyzes some of the physical and social factors associated with the occurrence of this system. A questionnaire survey was conducted in 2013 of 198 agricultural extension officers in each subdistrict (tambol) in the province to collect data on multiple cropping. An area of 10,384 ha (2.9% of the total rainfed rice area) was used for multiple cropping by 16,184 households (10.9% of all rainfed rice farming households). Both field crops (e.g., cassava, crotalaria, field corn) and vegetables (e.g., sweet corn, watermelon, Chinese radish) were grown. These crops generated USD414–49,072 per hectare per crop for a total revenue of USD32 million, which is three times higher than the value of rice grown in the same field area. However, the area that can be utilized for multiple cropping in different subdistricts may be limited by physical conditions, including availability of irrigation sources and soil texture, as well as social and economic factors such as availability of markets, institutional support, and farmer skills. In rainfed rice fields in Northeast Thailand, only a single crop of rice is commonly planted in the rainy season. Moreover, the yield of rice is generally low, averaging 1.7 t/ha. The low productivity coupled with low and fluctuating prices and high input costs severely limits the profitability of rice production and keeps many farmers trapped in poverty. Cropping intensification through multiple cropping could be a way to increase productivity and boost rural incomes. In the past, multiple cropping was rarely practiced in Northeast Thailand due to the limited biophysical resources (e.g., low and erratic rainfall, infertile sandy soils, limited availability of surface water supplies, serious problem of insect pests, long duration of the rice crop) (Terd et al. 1976a; 1976b; 1978a; 1978b; Aran et al. 1977a; 1977b; 1977c; KKU-Ford Cropping System Project 1982; Rambo 1991; Viriya 2001). Even when experimental multiple cropping systems were agronomically successful, farmers did not adopt them (Vichain and Aran 1990), mostly due to social and economic constraints, including limited markets for crops, labor competition, and lack of capital and knowledge (Rigg 1985; Vichain and Aran 1990). Although the factors limiting the adoption of multiple cropping were well understood in the context of rainfed agriculture in the 1980s, the situation in the Northeast has undergone rapid change since then. The context for multiple cropping is now quite different from what it was in the past. Key changes include the widespread adoption of the drought-tolerant RD6 glutinous rice variety and use of diesel pumps to provide supplementary irrigation water from newly dug farm ponds, which have helped to stabilize rice yields in years of low rainfall. The resulting higher and more stable yields of glutinous rice have allowed farmers to plant a larger share of their land with non-glutinous KDML105, which is raised as a cash crop, providing rural households with a new source of income. Agricultural intensification is occurring to an extent unimaginable just a few years ago. Relying on remittances sent back to their families by migrant workers, as well as cash earned by engaging in off-farm employment in new factories and service jobs in local urban centers, Isan farmers have been rapidly adopting modern agricultural technology, including increased use of chemical fertilizers, pesticides, and farm machinery (Grandstaff et al. 2008). Multiple cropping and cultivation of high-value crops to supply growing urban markets are also more commonly practiced (Rambo 2012). In Khon Kaen Province, farmers now employ a variety of locally developed double cropping systems to grow cash crops after the rice harvest and thus raise farm incomes. Some farmers grow high-value vegetable crops after the rice harvest, such as Chinese radish (Patcharaporn and Orawan 2011), tomato for seed production (Prapatsorn and Wareerat 2010), glutinous corn (Uraiwan et al. 2010), and various green vegetables, which provided a net income of USD7,727–12,733 per hectare per season. Even though some examples of multiple cropping after rice have been reported, there have been no detailed studies on the localities, planted areas, types of crops, and number of households adopting these systems; nor has there been any detailed analysis of the factors associated with the occurrence of each system of multiple cropping. This research, therefore, was undertaken in order to identify localities, planted areas, types of crops, and number of households growing crops after the harvest of rainfed rice in Khon Kaen Province and to identify physical, social, and economic factors associated with the occurrence of these cropping systems. The study area was the whole of Khon Kaen Province, Northeast Thailand. It is located between latitude 15°40′ to 17°5′N and longitude 101°45′ to 103°45′E. The province has an area of 10,886 km2 and had a population of 1,774,816 in 2013. It is divided into 26 districts and 198 administrative subdistricts (tambol) (Khon Kaen Provincial Office 2013). The topography of Khon Kaen Province can be divided into two main types: lowlands and uplands (hills or mountains). Most parts, over 80%, are flat to gently undulating land 101–200 m above sea level and include the broad floodplain along the Chi River. This plain is dotted with inselbergs (isolated and flat-topped mountains with nearly vertical cliffs) and inselberg ranges as high as 900 m above sea level in the northern and western parts of the province (Geo-Informatics Center for Development of Northeast Thailand 2009). There are 34 soil series in the province (IGES n.d.). Generally, the upland soils have been formed from parent material composed of fine-grained sandstone and shale. Soil groups distributed in the province are varied due to the topography. Tropaquepts with fine textures are found in the floodplain adjacent to the Chi River. Paleustults with sandy texture cover a large part of the northern and western parts of the province. Paleaquults are distributed mostly in the depression of undulating land and nonflood plain (Viriya 2001). The climate of Khon Kaen Province can be classified as Tropical Savannah according to the Koppen Climate Classification System. The average annual temperature is 27°C, and the mean maximum and minimum temperatures are 32.8°C and 22.4°C, respectively. The rainy season extends from May to October, with almost no rainfall in the remaining months. Rainfall is unevenly distributed within the year and varies from year to year (ibid.). Average annual rainfall during 2000–13 was 1,290 mm (Northeast Meteorological Center [Upper Part] 2014). The total cultivated area of Khon Kaen Province is 699,047 ha (64.19% of total area), of which only 98,349 ha (14%) is irrigated. In 2012, wet season rice was the major crop grown, accounting for 58.9% of the agricultural area. Sugarcane and cassava were the second- and third-most widely planted crops, covering 12.9% and 4.6% of the agricultural area, respectively (OAE 2014). Data on the locality, planted areas, types of crops, and number of households practicing multiple cropping after the rice harvest during the 2012–13 growing season in every subdistrict (tambol) were collected using formal questionnaires distributed to the agricultural extension officers in each tambol in 2013. The questionnaires were pretested in three selected tambol in order to examine their reliability and validity. After the questionnaires had been revised accordingly, they were distributed by mail or e-mail to the agricultural extension officers in every tambol. Follow-up telephone calls were made to ensure that the questionnaires were completed and returned to the researchers. Ultimately, 100% of the questionnaires were returned. Field observations were also made in selected subdistricts to verify the information provided by agricultural extension officers, and follow-up interviews were done with 28 farmers. These farmers were asked about the yields of crops they obtained per unit area and the price they sold them for, in order to calculate income per unit area. Physical and social factors determining the types of crop they grew were also ascertained. 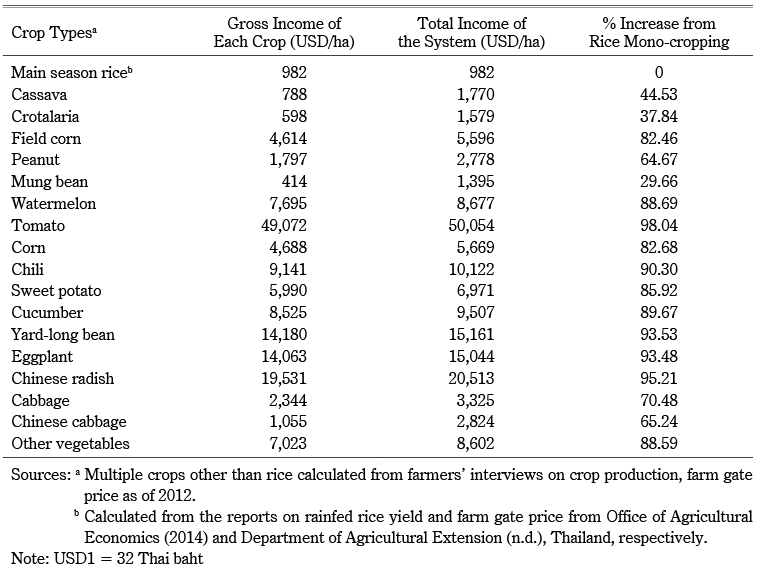 Provincial information about rice planted area, number of rice farming households, and the farm gate price of rice in the 2012/13 growing season were obtained from online databases of the Office of Agricultural Economics (2014) and Department of Agricultural Extension (n.d.), Thailand. All of the tambol having multiple crops after rice were identified, along with the crop species grown, the area planted with each crop, and the numbers of households growing each of these crops. The crops were then classified into two groups according to their characteristics: (1) field crops (non-perishable products, low water and nutrient requirements, and extensive management) included peanut, field corn, cassava, crotalaria, and mung bean; and (2) vegetable crops (perishable products, high water and nutrient requirements, and intensive management) included sweet corn, chili, watermelon, cucumber, eggplant, yard-long bean, sweet potato, tomato, Chinese radish, Chinese cabbage, cabbage, and other green vegetables. Percentages of multiple cropping area to total rice area, and rainfed rice farming households planting multiple crops to all rice farming households were calculated using Excel spreadsheets. The spatial distribution of multiple cropping according to the percentage of total rice area planted with multiple crops in each tambol was mapped using the ArcInfo GIS program. Of the 198 tambol in Khon Kaen Province, 178 (90%) planted a crop after the harvest of rainfed rice. As shown in Table 1, the area devoted to multiple cropping after rice was relatively small; multiple crops occupied only 10,384 ha, which is 2.9% of the total rainfed rice area in the province. The share of farm households engaging in multiple cropping was considerably larger, however, with 16,184 households planting crops after rice, which is 10.9% of the total number of rainfed rice farming households in the province. There is considerable variation among tambol in terms of the share of the rice area that is multiple cropped. Most of the tambol (84%) planted less than 5% of the total rice area with multiple crops. However, about 11% of the tambol planted multiple crops on 5.01–20% of their total rice area while about 5% planted multiple crops on more than 20% of their total rice area. The spatial distribution of the multiple crops planted after the rice harvest is shown in Fig. 1. Tambol having multiple crops on less than 5% of their total rice area are scattered throughout the province, while tambol having multiple crops on 5–20% of their rice area are located mostly in the southern part of the province and tambol with a higher proportion of multiple cropped area are in the northern part of the province. Field crops and vegetable crops are planted after the rice harvest in rainfed paddy fields in Khon Kaen Province. Field crops occupied about 2% of total rice area. About 81% of the total multiple cropping area is planted with these crops, including cassava, crotalaria, field corn, peanut, and mung bean. 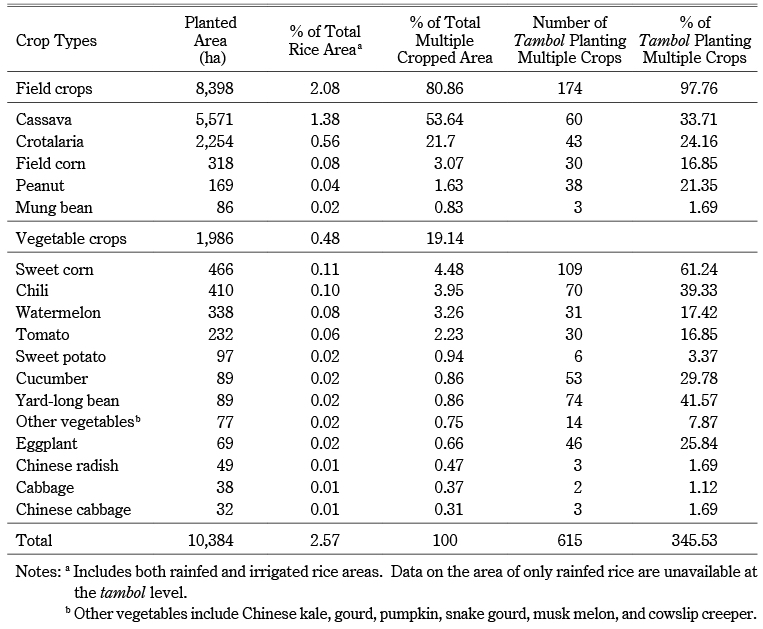 Vegetable crops, including sweet corn, chili, watermelon, cucumber, eggplant, yard-long bean, sweet potato, tomato, Chinese radish, Chinese cabbage, cabbage, and other vegetables, occupied 19% of the multiple cropping area, or only about 0.5% of the total rice land (Table 2). Although the area occupied by field crops is much larger than that occupied by vegetable crops, the number of rainfed rice farming households growing vegetables is almost as large (7,374 households) as it is for field crops (8,810 households), with households growing vegetables as a multiple crop accounting for 45.6% of all farm households engaging in multiple cropping (Table 3). Data from Table 4 show that total gross income per area of multiple crops grown after rice varied according to type of crop. Field crops, except field corn and peanuts, provided income lower than USD1,000 per hectare. Vegetables generally had a much higher return than field crops, ranging from USD1,055 to USD49,072 per hectare. The variation in income per hectare of different crops depends not only on the yields and prices of the different crop species, but also on the purposes for which the crop is produced. Field corn, watermelon, tomato, and chili were mostly grown under contract to produce hybrid seed. Hybrid vegetable seed production was first established by a few companies in a limited number of places in Northeast Thailand in the late 1970s but nowadays has spread to many additional places, with several competing local and international companies (Rosset et al. 1999). V. Benziger (1996) has indicated that contract farming is a program to help small farmers make a transition into high value-added crops. It provides revenues per area 6.5 times higher than those obtained by traditional farmers. In addition to contract farming, many other multiple cropping farmers engage in independent growing of vegetables such as yard-long bean, eggplant, Chinese radish, and cucumber to supply rapidly growing urban markets. These high-value crops give gross returns of USD7,023–14,180 per hectare. When the total gross annual revenue generated by multiple crops after the rainfed rice harvest was calculated based on area planted to each species, it was found that about USD32 million was generated in 2013, which is three times higher than the value of rice grown in the same field area (Table 4). Table 5 shows the different amounts of revenue generated by various multiple crops. 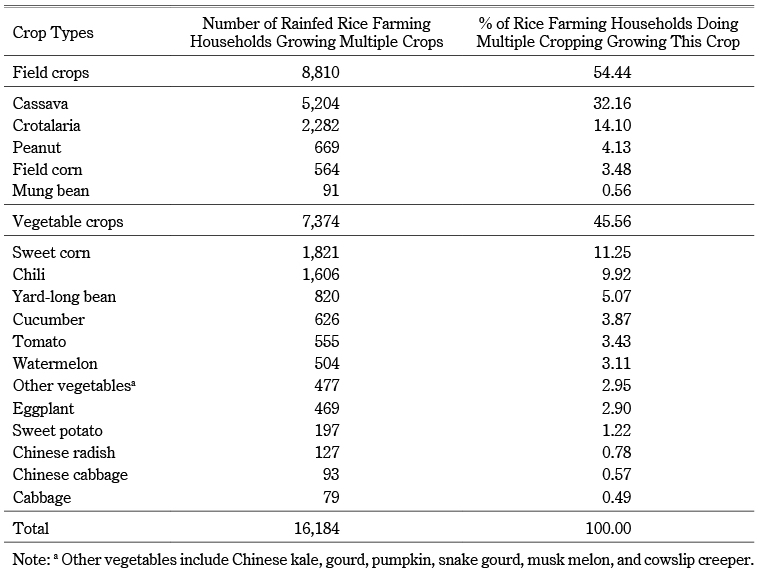 Field crops, particularly mung bean, generated only 30–65% more revenue compared to vegetable crops, which generated 65–98% more revenue than rice alone. The higher return per unit of land from crops grown after rice compared to rice mono-cropping has also been reported by G. Kar et al. (2006). The fact that growing vegetable crops provides the highest returns may explain the popularity among the farmers of vegetables as a multiple crop. Despite the high returns generated by vegetables, farmers still plant a much larger area with cassava, which provides lower returns per unit land. Information from farmer interviews and field observation by the authors showed that physical factors, such as availability of irrigation sources, suitable soil texture, and having a shallow water table, are the most important factors determining the presence of multiple cropping in an area. It was found that all vegetable crops except sweet potato relied heavily on the availability of irrigation. Farmers indicated that hybrid seed production required having a farm pond for irrigation. However, the supply of water from farm ponds is very limited, so the area that can support intensive cultivation is restricted accordingly. Water from the ponds is used mostly for supplemental irrigation of the main season rice crop during short-term droughts and to grow small quantities of vegetables and fruit on the bunds around the ponds (Ogura and Somsak 2002). If the water storage capacity of the ponds could be increased, it might be possible to expand the area planted with high-value multiple crops. Besides farm ponds, streams, rivers, public water bodies, and shallow wells are other sources of water that farmers rely on for multiple cropping. Growing peanuts after rice without irrigation depends on having a shallow water table and soil with good texture (Vichain and Aran 1990). Farmers also report that good soil texture is the main factor needed for growing sweet potatoes. Soil texture plays a significant role in the presence and availability of soil moisture and the availability of oxygen in root zone (Gines and Kaida 1982). Vichain Kerdsuk and Aran Patanothai (1990) found that soil type was one of the important factors affecting farmers’ adoption of multiple cropping systems. Availability of adequate labor supply is another important constraint on the adoption of multiple cropping. Only those households that have sufficient labor power are likely to engage in cultivation of intensive crops such as vegetables and hybrid seeds. Cassava, which requires relatively less labor, can be planted by more farmers. Availability of markets and institutional support were the next most important factors contributing to the existence of multiple cropping. This is especially the case with regard to contract farming of hybrid seed. Farmer skills are also an important factor in high-value specialty crop production. For example, production of hybrid tomato seed requires a good supply of highly skilled workers to emasculate the flowers (Wareerat 2014). In the case of cassava, there appear to be no especially important physical or institutional determinants; instead, farmers adopt this multiple cropping system as an adaptive strategy to cope with losses of rice yield caused by drought, as explained by A. M. S. Ali (1995). Although individual factors may sometimes affect the existence of specific crops in multiple cropping systems, usually there are multiple factors involved. For instance, in the case of crotalaria, farmers are supplied with seed by the Land Development Department, which also provides them with a guaranteed market for their crop. But in addition to such institutional support, only rice fields located in the lower part of the toposequence with good soil moisture and relatively loamy soil are suitable for this crop. Therefore, in order to assess the possibility of extending multiple cropping systems into other areas, we need to identify all of the interrelated factors affecting each crop. Although still practiced on only a small share of the total area of rainfed rice, multiple cropping after rice is now widespread in Khon Kaen Province. It is found in 90% of all subdistricts and is practiced by almost 11% of all rainfed rice farming households. The recent expansion of multiple cropping is part of the ongoing agrarian transformation that is reshaping the economy and society of rural Northeast Thailand (see Rambo, this issue). As part of this transformation, agriculture is simultaneously undergoing intensification and diversification. Farmers who formerly grew only a single low-yielding crop of glutinous rice in lowland paddy fields for home consumption, and cultivated cassava in upland fields to sell for cash, have greatly intensified their land use. They have intensified rice production by adopting new higher-yielding varieties of glutinous rice, using part of their paddy area to grow non-glutinous rice for sale, shifting from plowing with buffalo to plowing with tractors and from hand harvesting to the use of combine harvesters, and greatly increased their use of chemical fertilizers and pesticides, among other changes. At the same time, upland cropping has been diversified by the adoption of new crops, including sugarcane, eucalyptus, and rubber. The widespread adoption by farmers of multiple cropping after rice is part of this general trend to generate more cash income from their land. Although income earned from growing field crops after rice is relatively low, vegetable crops provide very high returns per hectare, making a substantial contribution to the economy of rural families. Although multiple cropping after rice can be a successful strategy for improving the livelihoods of rainfed rice farmers, its further expansion in Khon Kaen Province appears to be limited by many physical and economic factors. For example, only certain restricted areas within the province appear to be suitable for growing high-value vegetable crops. 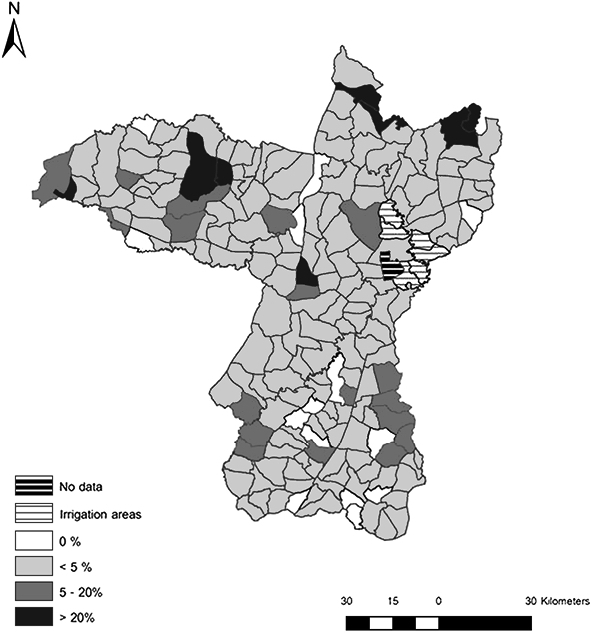 Further investigation is needed to identify locally specific factors (e.g., soil moisture, soil fertility, availability of supplemental irrigation sources, household composition and labor supply, and alternative local employment opportunities) that may facilitate or constrain the engagement of individual farm households in multiple cropping in different localities. This research was supported by the Young Researcher Supporting Program of Khon Kaen University. Additional support was provided by a grant (BRG5680008) from the Thailand Research Fund Basic Research Program to Prof. A. Terry Rambo. The views expressed are those of the authors and are not necessarily shared by the funding agencies. Sukanlaya Choenkwan provided useful assistance in data analysis and preparation of maps. The authors would like to thank all the tambol agricultural officers who responded to our questionnaires. Ali, A. M. S. 1995. Population Pressure, Environmental Constraints and Agricultural Changes in Bangladesh: Examples from Three Agroecosystems. Agriculture, Ecosystems and Environment 55: 95–109. Aran Patanothai; Terd Chareonwatana; Attachai Jintrawet; Chaichan Wongsaman; Amnouy Wilairat; Tawatchai Ubonkerd; Kanay Boontop; and Vitaya Pimsawadi. 1977a. Growing Field Crop before Rice in Upper Paddy Field. In The 1977 Annual Report of KKU-FORD Cropping System Project, pp. 116–129. Khon Kaen: Faculty of Agriculture, Khon Kaen University. ―. 1977b. Double Cropping of Field Crops with Rice in Lowland Paddy Field. In The 1977 Annual Report of KKU-FORD Cropping System Project, pp. 133–143. Khon Kaen: Faculty of Agriculture, Khon Kaen University. ―. 1977c. Growing Field Crops after Rice in Upper and Lowland Paddy Fields. In The 1977 Annual Report of KKU-FORD Cropping System Project, pp. 144–151. Khon Kaen: Faculty of Agriculture, Khon Kaen University. Benziger, V. 1996. Small Field, Big Money: Two Successful Programs in Helping Small Farmers Make the Transition to High Value-Added Crops. World Development 24(11): 1681–1693. Department of Agricultural Extension กรมส่งเสริมการเกษตร. n.d. Baep rai ngarn thi 1.9: Rai ngarn khormun phawa karn palit peut (raw taw 01) baep rai pi แบบรายงานที่ 1.9 รายงานข้อมูลภาวะการผลิตพืช (รต. 01) แบบรายปี [Report no. 1.9: Annual report of crop production (RT01)]. Online Agricultural Production Information System, Information Technology and Communication Center, Department of Agricultural Extension. http://production.doae.go.th/report/report_main_land_01_A_new2.php, accessed October 10, 2014. Geo-Informatics Center for Development of Northeast Thailand ศูนย์ภูมิสารสนเทศเพื่อการพัฒนาภาคตะวันออกเฉียงเหนือ. 2009. Pan tee cherng sathiti changwat Khon Kaen แผนที่เชิงสถิติจังหวัดขอนแก่น [Statistical map of Khon Kaen Province]. Department of Science, Khon Kaen University. http://gecnet.kku.ac.th/spatialdb/, accessed October 10, 2013. Gines, H. C.; and Kaida, Y. 1982. Paddy Land Suitability Classification in Relation to Its Potential for Multiple Cropping Systems. Southeast Asian Studies 20(3): 435–449. Grandstaff, T. B.; Grandstaff, S.; Limpinuntana, V.; and Suphanchaimat, N. 2008. Rainfed Revolution in Northeast Thailand. Southeast Asian Studies 46(3): 289–376. Institute for Good Environmental Strategies (IGES). n.d. Soil Management Guideline for Production of Sugarcane Cassava and Rice in KK. Soil_Management_Guideline_for_Production_of_Sugarcane_Cassava_and_Rice_in_KK.pdf, accessed May 3, 2017. Kar, G.; Verma, H. N.; and Singh, R. 2006. Effects of Winter Crop and Supplemental Irrigation on Crop Yield, Water Use Efficiency and Profitability in Rainfed Rice Based Cropping System of Eastern India. Agricultural Water Management 79: 280–292. Khon Kaen Provincial Office สำนักงานจังหวัดขอนแก่น. 2013. Kor Moon Paeun Tharn changwat Khon Kaen ข้อมูลพื้นฐานจังหวัดขอนแก่น [Khon Kaen Province database]. http://www.khonkaen.go.th/khonkaen6/main.php?cont=download, accessed July 20, 2014. Khon Kaen Rice Research Station ศูนย์วิจัยข้าวขอนแก่น. 2006. Karn jad khet sakkayaphaap karn phalit khao changwat Khon Kaen การจัดเขตศักยภาพการผลิตข้าว จังหวัดขอนแก่น [Zoning of potential rice growing area, Khon Kaen Province]. Bureau of Rice Research and Development, Rice Department. http://www.brrd.in.th/ricemap/data/Khon_Kaen/book.pdf, accessed July 20, 2014. KKU-FORD Cropping System Project. 1982. 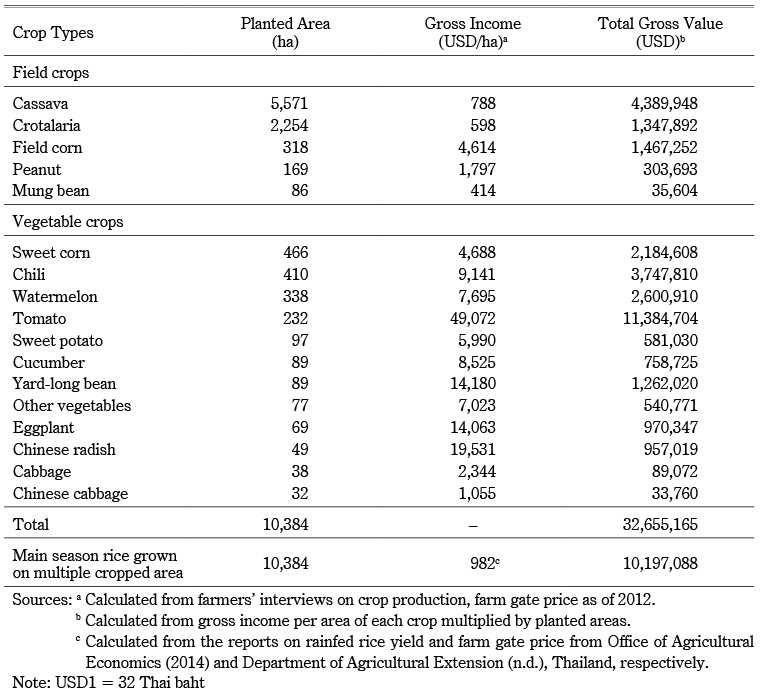 An Agroecosystem Analysis of Northeast Thailand. Khon Kaen: Faculty of Agriculture, Khon Kaen University, 167pp. Northeast Meteorological Center [Upper Part]. 2014. Annual Rainfall. Meteorological Department, Ministry of Information and Communication Technology, Thailand. www.khonkaen.tmd.go.th/it/rain_year.html, accessed July 19, 2014. Office of Agricultural Economics (OAE). 2014. Basic Agricultural Information, Thailand. http://www.oae.go.th/ewt_news.php?nid=13577, accessed October 10, 2014. ―. 2012. Basic Agricultural Information of 2012. Ministry for Agriculture and Cooperatives, Thailand. http://www.oae.go.th/download/download_journal/commodity56.pdf, accessed October 10, 2014. Ogura, Chikara; and Somsak Sukchan. 2002. Location and Function of the Reservoirs in Ban Nong Saeng, Northeast Thailand. In Development of Sustainable Agricultural System in Northeast Thailand through Local Resource Utilization and Technology Improvement, edited by O. Ito and N. Matsumoto, pp. 21–23. JIRCAS Working Report No. 30. Orawan Kanchart อรวรรณ เคนชาติ. 2013. Phon khong karn phalit phakkaad hua baep praniit khong kasettakorn tor karn trueng raeng ngarn nai pheun thii baan nong ngong Ampheo Ban Head changwat Khon Kaen ผลของการผลิตผักกาดหัวแบบประณีตของเกษตรกรต่อการตรึงแรงงานในพื้นที่บ้านหนองโง้ง อำเภอบ้านแฮด จังหวัดขอนแก่น [Effect of intensive Chinese radish production system on labor retention in Nong Ngong village, Ban Haet District, Khon Kaen Province]. Master’s thesis, Graduate School, Khon Kaen University. Patcharaporn Phumchantuk พัชราภรณ์ ภูมิจันทึก; and Orawan Kanchat อรวรรณ เคนชาติ. 2011. Patchai thii mii phon tor khwaam yang yuen khong rabob karn pluuk phakkaat hua thii baan Nong-Ngong, tambon Baanhad, amphoe Baanhad, changwat Khon Kaen ปัจจัยที่มีผลต่อความยั่งยืนของระบบการปลูกผักกาดหัวที่บ้านหนองโง้ง ตำบลบ้านแฮด อำเภอบ้านแฮด จังหวัดขอนแก่น [Factors influencing the sustainability of the Chinese radish production system at Baan Nong-Ngong, Tambon Baanhad, Amphoe Baanhad, Changwat Khon Kaen]. Program on System Approaches in Agriculture, Faculty of Agriculture, Khon Kaen University (mimeographed). Prapatsorn Wongsalee ประภัสสร วงศ์สาลี; and Wareerat Pannarat วารีรัตน์ ปัณณราช. 2010. Karn pluuk makhuea theet pheua phalit malet baep mii phantha sannyaa baan Ladnapieng tambol Sawathee amphoe Mung changwat Khon Kaen การปลูกมะเขือเทศเพื่อผลิตเมล็ดพันธุ์แบบมีพันธะสัญญา บ้านลาดนาเพียง ต.สาวะถี อ.เมือง จ.ขอนแก่น [Tomato seed production by contract farming in Lad Na Piang village, Savatee Subdistrict, Muang District, Khon Kaen Province]. Program on System Approaches in Agriculture, Faculty of Agriculture, Khon Kaen University (mimeographed). Rambo, A. T. 2012. The Agrarian Transformation in Northeast Thailand. Paper presented at the 8th National Agricultural System Conference, Nakorn Phanom University, September 5–7, 2012. Rigg, J. 1985. The Role of Environment in Limiting the Adoption of New Rice Technology in Northeastern Thailand. Transactions of the Institute of British Geographers 10 (4): 481–494. Rosset, P.; Rice, R.; and Watts, M. 1999. Thailand and the World Tomato: Globalization, New Agricultural Countries (NACs) and the Agrarian Question. International Journal of Sociology of Agriculture and Food 8: 71–94. Somkiat Konchan; and Kono, Yasuyuki. 1996. Spread of Direct Seeded Lowland Rice in Northeast Thailand: Farmers’ Adaptation to Economic Growth. Southeast Asian Studies 33(4): 523–546. Terd Charoenwatana; Aran Patanothai; and Anan Polthanee. 1976a. Growing Field Crops after Rice in Upper Paddy Field. In The 1976 Annual Report of KKU-FORD Cropping System Project, pp. 64–69. Khon Kaen: Faculty of Agriculture, Khon Kaen University. ―. 1976b. Double Cropping of Field Crops with Rice in Lowland Paddy Field. In The 1976 Annual Report of KKU-FORD Cropping System Project, pp. 69–71. Khon Kaen: Faculty of Agriculture, Khon Kaen University. Terd Charoenwatana; Viriya Limpinuntana; Aran Patanothai; Attachai Jintawet; Kanay Bontob; Vinai Sornwat; Vitaya Pimsawadi; and Thawatchai Ubonkerd. 1978a. Growing Field Crops before Rice in Upper Paddy Fields. In The 1978 Annual Report of KKU-FORD Cropping System Project, pp. 74–85. Khon Kaen: Faculty of Agriculture, Khon Kaen University. ―. 1978b. Planting of Field Crops before Rice in Lowland Paddy Fields. In The 1978 Annual Report of KKU-FORD Cropping System Project, pp. 94–96. Khon Kaen: Faculty of Agriculture, Khon Kaen University. Uraiwan Thongkamkaew อุไรวรรณ ทองแกมแก้ว; Juraluck Mahasan จุฬาลักษณ์ มหาแสน; Sunee Chatsiriyingyong สุนีย์ ฉัตรศิริยิ่งยง; and Ung Sopheap อุง โสเพียบ. 2010. Kanchatkarn pheunthii pluuk khaopod khong kasettakorn: Koranee sueksa pheunthii ban Nong Boua tambol Nong boua, amphoe Ban phang changwat Khon Kaen การจัดการพื้นที่ปลูกข้าวโพดของเกษตรกร: กรณีศึกษา พื้นที่บ้านหนองบัว ต.หนองบัว อ.บ้านฝาง จ.ขอนแก่น [Farmer management on corn production: A case study at Baan Nongbou, Nongboa Subdistrict, Baan Fang District, Khon Kaen Province]. Program on System Approaches in Agriculture, Faculty of Agriculture, Khon Kaen University (mimeographed). Vichain Kerdsuk วิเชียร เกิดสุข; and Aran Patanothai อารันต์ พัฒโนทัย. 1990. Botrian jark karn totsop lae khayaai phon karn pluuk thua li song lang na doi mai arsai namchollapratarn khong mahawittayalai Khon Kaen บทเรียนจากการทดสอบและขยายผลการปลูกถั่วลิสงหลังนาโดยไม่อาศัยน้ำชลประทานของมหาวิทยาลัยขอนแก่น [Lesson learned from testing and extension of growing peanut after rice without irrigation of Khon Kaen University]. Farming System Research Project, Khon Kaen University. Technical Report 63(63): 24–35. Viriya Limpinuntana. 2001. Physical Factors as Related to Agricultural Potential and Limitations in Northeast Thailand. In Natural Resource Management Issues in the Korat Basin of Northeast Thailand: An Overview, edited by S. P. Kam, C. T. Hoanh, G. Trebuil, and B. Hardy, pp. 3–17. Limited Proceedings No. 7. Los Banos, International Rice Research Institute, Manila. Wareerat, P. วารีรัชต์ ปัณรราช. 2014. Karn jad karn raeng ngarn khong khreua ruean lae chumchon samrap karn phalit maletphan makhuea thet pai tai kaset phantasannyaa muu baan Lad Na Piang, tambol Savatee, amphoe Muang, changwat Khon Kaen การจัดการแรงงานของครัวเรือนและชุมชนสำหรับการผลิตเมล็ดพันธุ์มะเขือเทศภายใต้เกษตรพันธะสัญญา หมู่บ้านลาดนาเพียง ตำบลสาวะถี อำเภอเมือง จังหวัดขอนแก่น [Household and community labor management for tomato seed production under contract farming, Lad Napiang village, Savatee Subdistrict, Muang District, Khon Kaen Province]. Master’s thesis, Graduate School, Khon Kaen University. « Vol. 6, No 2, WATANABE Moriaki et al.